Earlier, US President Donald Trump announced that Washington would be pulling its estimated 2,000 US troops out of Syria, and gave the Pentagon four months to complete the withdrawal. Israeli Prime Minister Benjamin Netanyahu said he and US Secretary of State Mike Pompeo would discuss ways to intensify intelligence and operations cooperation between the US and Israel in Syria and elsewhere to block what he called "Iranian aggression" in the region, Reuters has reported. "We have a lot to discuss. We're going to be discussing our, the intense cooperation between Israel and the United States, which will also deal with the questions following the decision, the American decision, on Syria," Netanyahu said. The talks, the prime minister said, would look at "how to intensify even further our intelligence and operational cooperation in Syria and elsewhere to block Iranian aggression in the Middle East." Netanyahu made the comments ahead of a meeting with Pompeo in Brasilia on Tuesday, where both men arrived to attend the inauguration ceremony of recently elected Brazilian President Jair Bolsonaro. 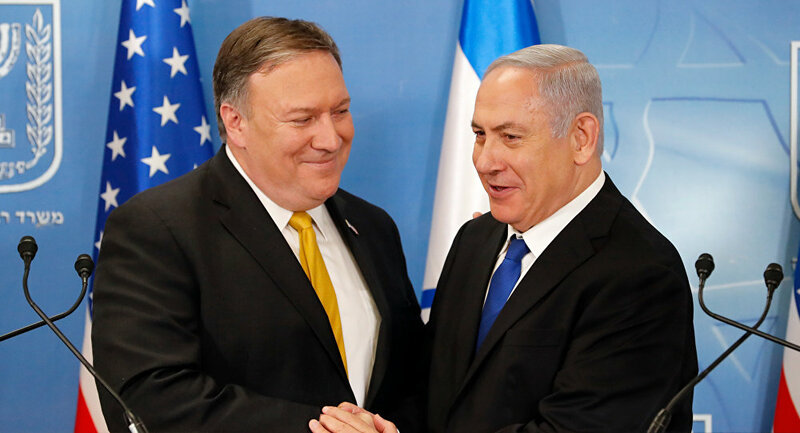 Earlier, an Israeli official told Israeli media that Netanyahu would ask Pompeo to slow the withdrawal of US troops from Syria. Ahead of Tuesday's meeting, Pompeo assured Netanyahu that President Trump's decision on Syria "in no way changes anything that this administration is working on alongside Israel." "The counter-ISIS* campaign continues, our efforts to counter Iranian aggression continues, and our commitment to Middle East stability and protection of Israel continues in the same way before that decision was made," Pompeo said. Earlier, Israeli military intelligence chief Tamir Hyman charged Iran with working to increase its clout in Iraq and Syria as a "platform for a force build-up that could also threaten the state of Israel." On Monday, Trump continued to defend his decision to withdraw American troops from Syria, accusing his critics of hypocrisy and saying that any other US president would have been applauded as a "national hero" for the decision. On December 19, the White House announced that it would be withdrawing US troops from Syria within the next 60 to 100 days. The decision prompted US Secretary of Defence Jim Mattis and special presidential envoy for the US coalition in Syria Brett McGurk to announce that they would be resigning. Trump justified the withdrawal by saying that US forces had achieved their primary goal in Syria — the defeat of Daesh, and that the pullout would fulfill a campaign promise. Trump's Democratic opponents and members of his own party attacked him over the move, with hawkish Republican Senator Lindsey Graham calling the decision an "Obama-like mistake." The US military presently illegally occupies a strip of territory in southern Syria near the Jordanian border, and has deployed troops in the country's northeastern, governed by the majority Kurdish Syrian Democratic Forces militia. Damascus and its allies have condemned the US presence in Syria as "illegal," while Washington's Turkish allies have criticized the US for cooperating with the Kurdish militias, whom Ankara classifies as terrorists. *aka Daesh, a terrorist group outlawed in Russia and many other countries.